Can you believe it? Just because there is a Royal Wedding this week, people are losing their minds and buying all kinds of souvenirs to commemorate the occasion. Of course, knitters are much more sane and save their money for practical items: yarn for a nice warm sweater for winter, or mittens or socks. Nothing frivolous. Of course not. Yeah, right. Guess what? I'm one of *those* people! 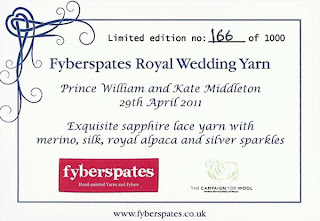 Fyberspates produced a special yarn for the occasion that is drop-dead gorgeous and I couldn't resist. I knew, from the pictures and description, that it was going to be pretty, but it's much, much nicer than I thought it could possibly be. Check out the stunning sapphire color with little sparkles embedded in it. Doesn't it remind you of Diana's ring? That was the idea. It is incredibly soft. 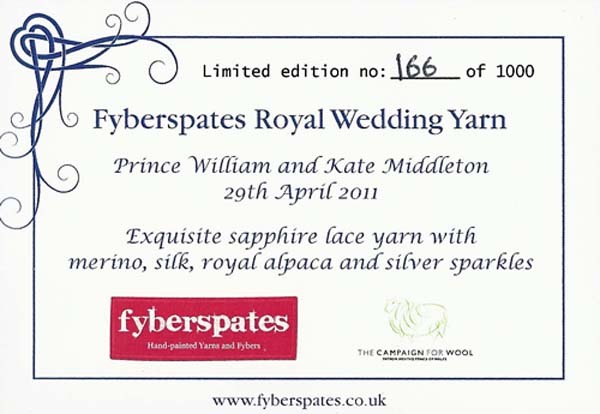 This picture is from Fyberspates' website. I only ordered one skein. It was a little pricey, but worth it. 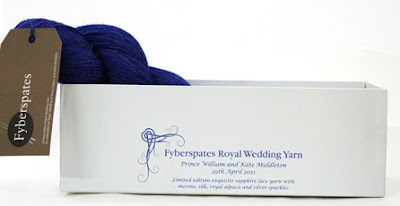 I have no idea what I'm going to make with the yarn. For now, I'm quite content to just admire it. I imagine that I'll find the perfect shawl in time. I'll keep my eyes open for a pattern that "speaks to me". It's gorgeous! Can't blame you for succumbing.